This bank's performance is an outlier among large banks. If you asked me to rank all the bank stocks in the U.S. by overall bank quality and performance, First Republic Bank (NYSE:FRC) would, without question, be at or very near the top. Here are three major reasons why this bank is a clear buy. First Republic's business model has a slight, but significant, difference from other large banks. Instead of targeting certain geographies with an expensive branch network and community presence, the bank, instead, targets only high-net-worth individuals in seven carefully chosen metro areas on the east and west coasts. Think about it: Banks make money by accepting deposits, making loans, and providing other fundamental financial services like wealth management. What demographic has the most deposits, are the most creditworthy, and have the most need for robust wealth management, insurance, and financial planning services? First Republic's seven markets are home to 56% of all the high-net-worth households in the U.S. Instead of sending in thousands of troops to blanket a huge area, they send in a sniper to target only the most high-value targets. Competition for these customers is fierce, and the bank has developed tactics to support their strategy. The bank takes pride in its low employee turnover, creating stable relationships over long periods of time with its clients. That helps keep clients happy and loyal to the bank for life. To bring in new customers, the bank focuses first on its mortgage loan product. First Republic specializes in jumbo mortgage loans, the kind that wealthy individuals use to buy their expensive homes. That mortgage sale is followed immediately by a cross-sell process that averages eight products sold per new loan client. Most banks are lucky to end up with the loan and a checking account. It's this kind of performance that sets First Republic apart. Here's the thing about banks: Banks are in the business of selling loans. But if a loan doesn't get repaid, then the bank loses money. Potentially, a lot of money. Sometimes, so much money that the bank will fail. A bank's ability to consistently make loans that are repaid, and therefore don't create losses down the road, is a reflection of the bank's credit culture. The best credit cultures get deals done to allow for growth and profitability without allowing shaky deals to sneak through the door. It's a little bit of science, and a whole lot of art. And in this art, First Republic is a true master. The ratio of the bank's non-performing assets -- its severely past-due loans plus foreclosures -- to its total assets was just 0.1% as of the second quarter. A sample of 60 other similarly sized U.S. banks average a ratio of 0.66%, almost seven times higher than First Republic. The second quarter was no fluke either. During the past 10 years, charge-off rates at the 50 largest U.S. banks has been 4.3 times higher than at First Republic. How do they do it? By only making loans to borrowers who can pay back the debt. The median credit score of a First Republic mortgage loan borrower is 773. The bank's median down payment on a home loan is 40%, double the typical standard at other institutions. Down-payment requirements for other loans, like apartments or commercial real estate, are even higher. The median net worth of a First Republic mortgage loan customer is $2.9 million dollars. That median borrower has liquid assets of $595,000. With borrowers like that, and just as high underwriting requirements, it's pretty clear why the bank doesn't have the same problem loan issues that plague so many other banks. Risk and reward tend to move up and down together; higher risk often leads to higher rewards, and vice versa. With First Republic's low-risk credit culture, it's not crazy to expect the bank to have lagging earnings. It's not crazy, but it is flat out wrong. In the 2015 second quarter, First Republic reported 10.2% return on equity, beating the average for large regional banks of 8.4%. The second-quarter's results are not a one-off performance. The bank has been putting up solid numbers for years, and shows no signs of stopping. Reviewing the bank's return on equity and assets on a trailing 12-month basis, a steady and impressive trend is obvious. 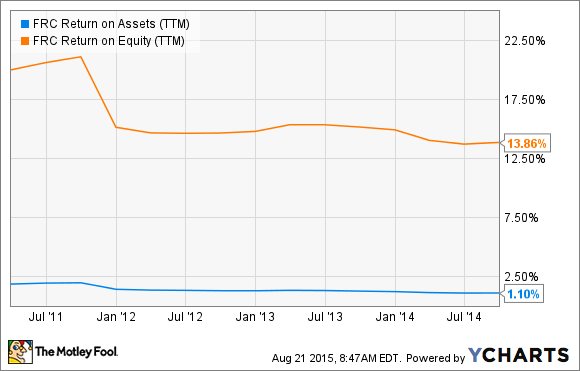 FRC Return on Assets (TTM) data by YCharts. Still not convinced? Consider that, from the third quarter of 2010 through this year's second quarter, the bank's earnings per share have increased at a 17% compounded annual growth rate. Tangible book value for share increased 16% by the same measure. Banking is like a three-legged stool. Banks need credit quality, profits, and growth. If they are missing any one of the three, the stool will fall over. First Republic has found that special sweet spot in the banking world where it can consistently have all three. For that reason, I'm very bullish on this stock for the long term.